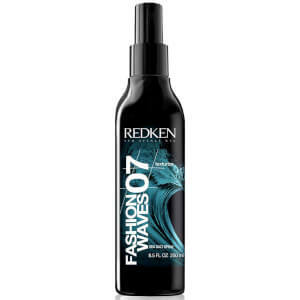 Achieve surfer inspired, beachy locks with Redken Fashion Waves Sea Salt Spray, a lightweight salt-infused spray that leaves your hair tousled and textured with ocean vibes. Creating definition with a matte finish and medium hold, the sea salt spray can be scrunched onto damp or dry hair to add body and movement for animated, beachy waves. Shake well and mist through damp hair in sections, allow to air dry or diffuse. Tip: To achieve loose waves in straight hair, and enhanced definition in wavy hair, mist liberally onto damp hair and scrunch. Continue to reapply until desired texture is achieved. Mist onto damp hair and air-dry, then re-apply throughout the day to re-animate waves. Magnesium Sulfate (also known as epsom salt) is highly water soluble and hygroscopic (absorbs moisture from the air) which adds instant texture to create a tousled, beachy look.